Roses are the forever sign of deep love, passionate, care, romance, respect and purity. This is the best gift that you should gift to your loved ones to tell your emotions to them. 60 mixed roses are wrapped elegantly in red paper packing and adorned with the pink ribbon bow. Deliver the enduring smile in your loved one's life by sending them this beautiful bouquet of mixed roses. 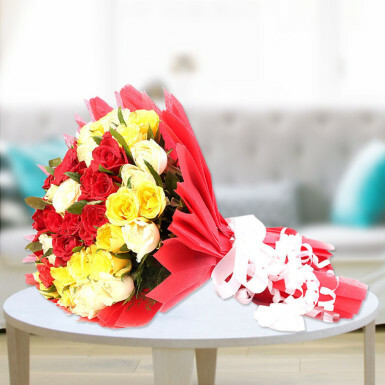 The bouquet can be gifted in any occasion like birthday, anniversary, success party, mother’s day, valentine’s day, propose day, rose day, new year, Christmas Eve and many more.